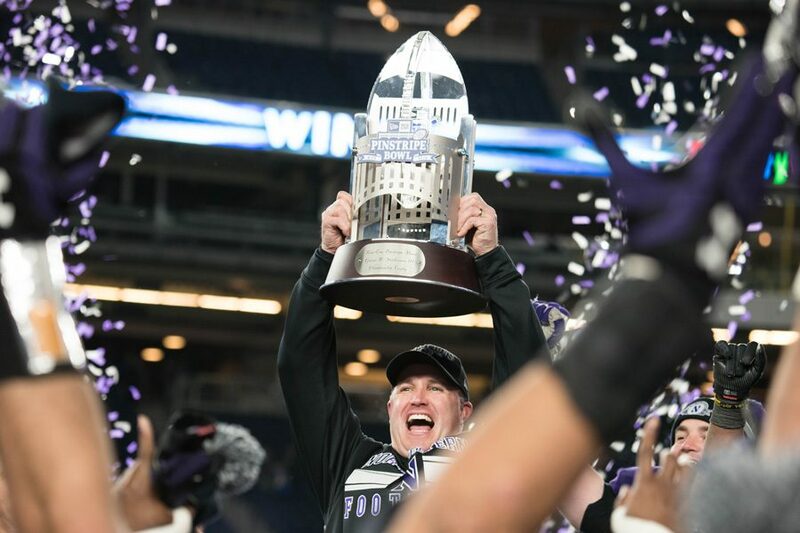 Pat Fitzgerald celebrates with the Pinstripe Bowl trophy. The football coach received a contract extension that will keep him in Evanston until 2026. CHICAGO — When Pat Fitzgerald arrived at Northwestern in 1993, he entered an environment where, he said Tuesday, athletes were not properly supported. When his 10-year contract extension to remain the Wildcats’ football coach was officially announced Tuesday — alongside a similarly lengthy extension for men’s basketball coach Chris Collins — Fitzgerald said the athletics department he saw around him barely resembled the one he saw as an underclassman. And in the 24 years in between, Fitzgerald has helped direct the course of, and perhaps even embodied, that steady ascension to a competitive Big Ten school. Fitzgerald’s 11-season coaching tenure to date has been, undeniably, the best 11 seasons in school history. In that time, NU has more than doubled its number of all-time bowl appearances and 10-win seasons — from five to 11 and from one to three. The Cats have also gone no worse than 5-7 in any year since Fitzgerald’s first, remarkable accomplishments for the nation’s second-losingest program of all time. For that unprecedented success, athletic director Jim Phillips rewarded Fitzgerald with a contract that will keep him in Evanston through 2026. It was at a recent men’s basketball event, the NCAA Tournament in March, when Fitzgerald said he was reminded of how far NU athletics has come. While tailgating as a fan before the game in Salt Lake City, Fitzgerald said he ran into a number of late 20th-century athletes and wanted to give them a hug. From the start, it was Fitzgerald who helped end that era of disregard. In winning back-to-back national defensive player of the year awards in 1995 and 1996, the linebacker guided the Cats to back-to-back Big Ten titles and put the university on the collegiate football map. A year later, NU built a new practice facility and renovated Dyche Stadium into Ryan Field. Two decades later, that mindset shift into a university with a dedication to sports is long forgotten. But Fitzgerald — the man who initiated it, has guided it along the way and will now continue to do so for at least another decade — certainly is not.